Into The Storm is a biographical film about Winston Churchill as he leads Britain into World War II. The movie is directed by Thaddeus O'Sullivan and stars Brendan Gleeson, who plays the former British Prime Minister. Into The Storm is a sequel to the 2002 TV movie, The Gathering Storm, which details on the life of Churchill in the years just prior to the war. Also starring Janet McTeer, James D'Arcy and Patrick Malahide. HBO continues its string of high-profile made for cable movies with 2009’s Into the Storm. A continuation of 2002’s The Gathering Storm, the film concentrate on British Prime Minister Winston Churchill (Brendan Gleeson) during World War II. Into the Storm shows us Churchill in 1945 as he waits to see if the Brits will re-elect him as Prime Minister. (Short answer: no. Attlee Clement was PM when the war finally ended in August 1945.) While we occasionally visit Churchill and wife Clementine (Janet McTeer) as they stew, most of the film follows him through World War II. After a quick glimpse of 1945, we jump to the spring of 1940. The Nazis are on the march in continental Europe, and Churchill takes over as PM. We watch Churchill’s progress as a leader through various significant aspects of the conflict. This eventually leads us to 1945 and his electoral fate. While I like much of Storm, it suffers from one significant problem: its length. I find it stunning that someone thought they could adequately cover Churchill’s life from 1940-1945 in the span of any single movie, much less one that clocks in under 100 minutes. Entire films could be made about experiences like the evacuation at Dunkirk – and they have. Storm takes on a very superficial “greatest hits” approach that means we rush through everything. But that doesn’t mean Storm fails to offer an entertaining experience. Indeed, despite its rapid pace and utter lack of depth, the film really proves to be quite engaging. Granted, it seems like it’d be hard not to produce decent material from all of the events depicted here; you’d be hard-pressed to find a 99-minute movie with more life or death situations. There’s so much natural drama that Storm would’ve had to work hard to utterly fail. Still, the filmmakers deserve credit for the engaging nature of Storm, as do the actors. Only Gleeson – present in virtually every scene – gets enough screen-time to produce a personality with any form of depth, and the nature of the production makes it tough for even Churchill to emerge as three-dimensional. Sure, we see a lot of Winston, but he jumps from one spot to another with such alacrity that it’s tough for the character to develop. Nonetheless, Gleeson creates a satisfying performance. He avoids the usual pitfalls that might come with a sloppy impersonation and he lends wit, charm and warmth to Churchill. Gleeson manages to do a lot with a little. That goes double for McTeer as Clementine. She doesn’t appear on-screen a whole lot, and she usually comes across as something of a nag; she seems to just like to pester Churchill. Despite those negative possibilities, McTeer brings real personality to the role. We probably shouldn’t like her, but we do, and we see how she aided the relationship. It’s a very nice performance for a seriously underwritten role. The suit at HBO who decided to make Into the Storm a one-off flick needs to be fired; the material demands a John Adams-style mini-series. Despite that pitfall, the film manages to succeed on its own level. While too brief and superficial, it still packs a lot of entertainment value. Into the Storm appears in an aspect ratio of approximately 1.78:1 on this single-sided, double-layered DVD; the image has been enhanced for 16X9 televisions. The movie came with a mediocre transfer. Sharpness was acceptable but not great. Some of the problems stemmed from the moderate edge enhancement that cropped up through the film. Those haloes meant that wider shots tended to look ill-defined and iffy. Close-ups looked fine, but most wider elements seemed muddy and a bit blocky. Source flaws were absent, at least; some documentary footage came with grain and marks, but I couldn’t take off points for those instances. Colors were decent. The movie stayed with a chilly palette that was consistently low-key, and the hues were acceptable. They didn’t display much vivacity, though; while the production design meant they’d be subdued, the tones found here remained too flat for my liking. Blacks looked moderately deep but not great, while shadows presented fair clarity. This was a mediocre presentation and a “C” image. On the other hand, the Dolby Digital 5.1 soundtrack of Into the Storm was pretty satisfying. Though not exactly an action spectacular, the film included enough battle scenes to give it real life. Planes soared from spot to spot and various war elements opened up the spectrum in an engaging way. Even quieter scenes like those at the beach boasted a nice sense of place; they used the side and surround speakers in a compelling manner. Audio quality satisfied. Speech was a major factor, and all the lines appeared concise and distinctive. Music showed nice range and clarity, while effects worked fine. Those elements came across as accurate and dynamic. All in all, this was a surprisingly good mix. Two extras round out the set. We find an audio commentary from producer Frank Doelger and writer Hugh Whitemore. Both sit together for this running, screen-specific look at research and factual background to the film’s events, cast and performances, story/character issues, sets and locations, period details, and a few other production topics. Doelger and Whitemore combine well in this pleasant little chat. They offer a nice mix of facts about the film and the era’s history. The pair expands on the flick as they give us a brisk, engaging discussion. You’ll find a very good examination of Storm via this commentary. The participants cover a nice variety of subjects and reveal a lot of useful details. The track digs into the movie in a satisfying way. 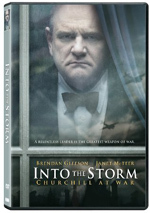 The Making of Into the Storm runs seven minutes, 30 seconds and features remarks from Doelger, Whitemore, director Thaddeus O’Sullivan, producer Tracey Scoffield, and actors Brendan Gleeson and Janet McTeer. “Making” offers a recap of the film’s story/characters as well as performances. “Making” exists to promote the movie. It includes a few mildly interesting notes but don’t expect much from it. At 99 minutes, Into the Storm is far too short to adequately cover its subject matter. To offer a strong portrait of Winston Churchill during World War II, we need at least five or six more hours of screentime. Nonetheless, Storm does well with its limited length, and it offers an entertaining overview. The DVD presents bland visuals along with good audio and an interesting audio commentary. 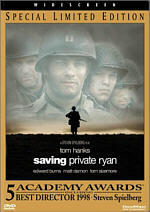 This is an enjoyable film that will appeal to WWII buffs and neophytes alike.